How am I supposed to drive home now? 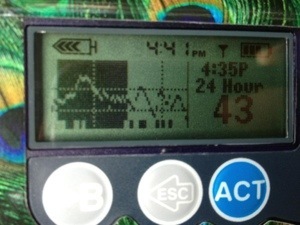 I have my CGM vs. meter debate. One says I’m 136 and trending down… The other says I’m 196. An hour later, I get this. So what’s more accurate? So my trials and tribulations continue. I change jobs and suddenly my control goes out the window. 1) I’m more stressed out than I lead on: new job and environment, new people to please, another showcase at the end of the month, working two jobs and 12 hour days, competing at the end of July, losing my dance home… Yeah I guess that could effect things. 2) I’m hormonal. PMS never really affected my blood sugars THAT much, or maybe because I’ve been running lower than usual, I notice spikes into the 250s a little quicker. And then I get sicker if they don’t come down quick enough. Just option 1 and 2.